How does one defend an immense dominion like the Dutch East Indies against a foreign invasion? The question had plagued the Dutch government for many, many years and during the early 1930’s the need for drastic measures became obvious. A succession of penny-pinching short-sighted, complacent governments had left the colony with thread-bare and outdated means of defence. But what was the best way to ensure safety? Predictably, a controversy developed between the Royal Netherlands Navy (RNN) and the Royal Netherlands Indies Army (KNIL). According to the RNN, the American possessions to the north (The Philippines) and the British dominions to the west and south (Malaya, British Borneo and Australia) would serve to ‘channel’ any invasion fleet into a limited number of routes. A well-equipped, modern fleet, supported by a large number of flying boats, would be able to deal with it before it came into striking range of the Dutch islands. The KNIL, on the other hand, had definitely fallen under the spell of General Giulio Douhet’s theories published in his 1921 book “The Command of the Air”. The KNIL vision won the day after long and bitter debates. It was decided to expand its Air Arm, but with bombers only. Very conveniently the Glenn L Martin Co offered the Model 139 bomber in October 1935 to KNIL commander General Boerstra, (who had been strongly in favour of the land-based bomber procurement). After a brief bout of political in-fighting with the Ministry of Colonial Affairs (who wanted to order Fokker’s new T-V twin engined bomber) and a hassle with the supplier (about license building the bomber in the Netherlands), an initial order was placed for 13 bombers. Over a three year period the Dutch government would buy 121 of the various 139 WH models. The decision to protect the NEI by land-based bombers had far-reaching consequences. A string of forward operating bases had to be built, on which bombers could be concentrated in the event of an imminent attack. 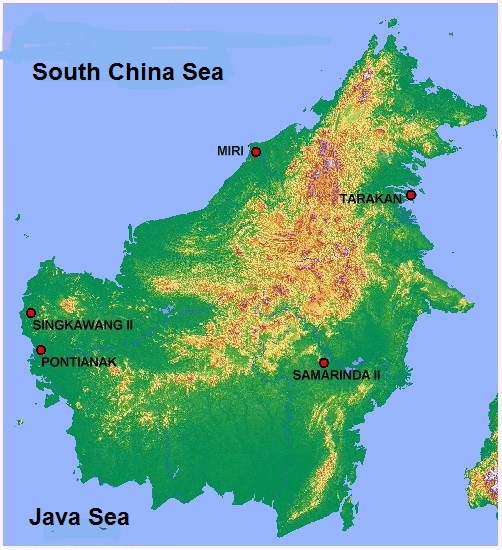 The outer ring consisted of (from east to west) Laha (Ambon), Kendari II (Celebes), Tarakan (NE Borneo), Samarinda II (East Borneo), Singkawang II (West Borneo) Pakan Baru (Central Sumatra) and Sabang (North Sumatra). The inner ring consisted of Penfui (Timor) Den Passar (Bali) Makassar (Celebes) Balikpapan, Bandjarmasin and Kotawaringin (Borneo) and Palembang P2 (Sumatra). In addition to this effort, several airfields on Java were expanded or new fields were constructed to serve as home bases for the expanding bomber force. These included Tjililitan (Batavia) Kalidjati, Andir (Bandung), Ngoro (Blimbing) and Singosari (Malang). The exact location of some of these airfields was deliberately mismarked on maps and some of these airfields consisted of 2 or 3 separate ‘strips’ to confuse the Japanese. To maintain a level of secrecy for as long as possible, only the minimal ground facilities were provided at most of these bases; they were in fact little more than grass strips, with small dispersals and a stock of bombs and fuel. Some possessed a radio beacon, but these were switched off when the war broke out, in an attempt to keep the fields hidden. Refueling facilities were also minimal; refuelling was done manually, straight out of drums rolled up to the aircraft. Bombs had to be loaded manually in most places. Yet despite all these precautions, only Palembang P2, remained undiscovered for any length of time. Most fields were located by the simple tactic of fighters ‘shadowing’ a bomber or a transport plane until it landed. Once the whereabouts of the ‘secret’ fields had been discovered, it became painfully clear that, with virtually no ground defenses, they were extremely vulnerable to enemy air attack. The Samarinda II airfield was probably one of the most extraordinary places in the whole Dutch East Indies in 1941-1942. Hidden deep in the Borneo jungle, between the towns of Longiram and Melak, and extensively camouflaged, it was one of the few ‘Secret Airfields’ with its own KNIL garrison (of approx. 500 men). It also had some form of defense, both AA guns and fighters. Glenn Martin Bombers operated from this field during the Battles for Tarakan and North Borneo and US B-17’s staged through on their raids on Davao, Mindanao, in the Philippines. The Japanese Air Force finally discovered Samarinda II on January 24, 1942 and the field was strafed and bombed during the next few days. The five Dutch Brewster Buffaloes tasked with its defence had to take on swarms of Mitsubishi Zeros. On January 28, four of the Buffaloes had been shot down and the field was evacuated. Interesting fact: A Mitsubishi Zero crash-landed almost undamaged at Samarinda II, thus offering the Dutch pilots a real close-up view of their opponent. This airfield was located close to Pontianak and played an important role in the defense of North Borneo. Glenn Martin bombers operated from Sinkawang II during operations in Malaya, Singapore and North Borneo. The field was evacuated after Pontinak and Samarinada had capitulated. It was occupied by the Japanese on January 29. Palembang II (or P2) was located near Karengendah approximately 42 miles by road from Palembang and across the Musi river. It was a huge natural field, about ten miles in perimeter, with a good natural cover for aircraft and totally invisible from the road. Access from Palembang was hampered by the fact that there was a ferry but no bridge. It was deliberately made to look like similar clearings in the same area and this made it hard for friendly aircrews, despite being briefed, to find it from the air. Its secrecy was so well preserved that, although at one time more than one hundred aircraft were based there, the Japanese never located it despite reconnaissance flights by day and by night. When Japanese paratroops carried out a surprise landing between Palembang town and the airfield (P1) on Feb 14, 1942, fighters and bombers from P2 attacked the Japanese barges on the Musi river during Feb 15 but wre unable to halt the invasion. Palembang II was evacuated on Feb.17 and all serviceable planes were withdrawn to Java. This field was located approx. 50 miles south of Surabaya (East-Java). It had two 4,000-foot smooth sod runways, and sod taxiways led into jungle around the field where the pursuits could be camouflaged and hidden from aerial observation. The airfield was so carefully camouflaged that an experienced Dutch pilot had to guide arriving USAAF P-40s to their new base. To keep its location secret, upon takeoff, the pursuit pilots hedge-hopped to a town about 15 miles away before forming up and climbing to altitude. Landings were accomplished in the same way; approaches were made at low altitude, and the pilots “popped up” only long enough to lower their wheels before landing. USAAF P-40’s and B-17’s operated from Ngoro during February 1942. The field was occupied early March 1942 by the Japanese.